Taza Khurmatu (Iraq) (AFP) - In the Iraqi town of Taza Khurmatu, a motley brigade of Shiite Turkmen locals adjust their weapons and headscarves before heading out to defend their homes from encroaching Sunni militants. The men range from those in their teens, yet to grow a moustache or see combat, to elders approaching retirement and weary of war. They are armed with assault rifles, machineguns and a few rocket-propelled grenade launchers, and describe themselves as members of a Sahwa or "Awakening" force -- a reference to the collection of largely Sunni Arab militiamen who helped US forces turn against Al-Qaeda from late 2006. 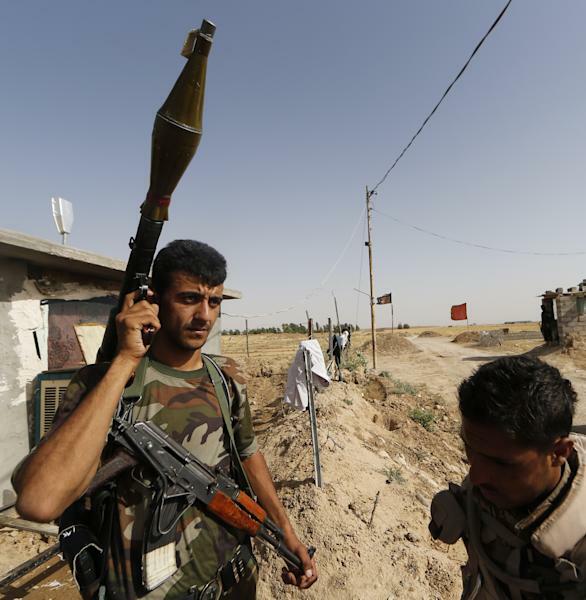 At the time, the shifting loyalties helped turn the tide of Iraq's insurgency. "During the time of the Americans, the Sahwa force fought the terrorists, and our men here were part of that," says the local commander of the force, Issam Abbas. "The force that is fighting today is built on that force." 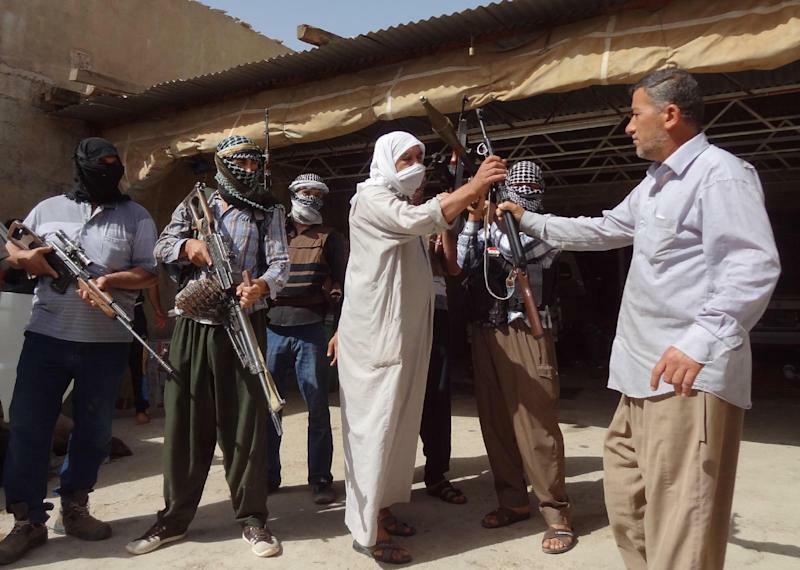 Abbas, 45, used to work in commerce, but has committed himself fulltime to the Sahwa force in the town of Taza Khurmatu, 20 kilometres (12 miles) south of Kirkuk, for the past year. Locals say the force was initially formed in 2009, after a massive truck bomb in the area killed dozens. With a drop in violence, its members returned to civilian life, but in the past year the force regrouped as Sunni militant activity in the area grew. 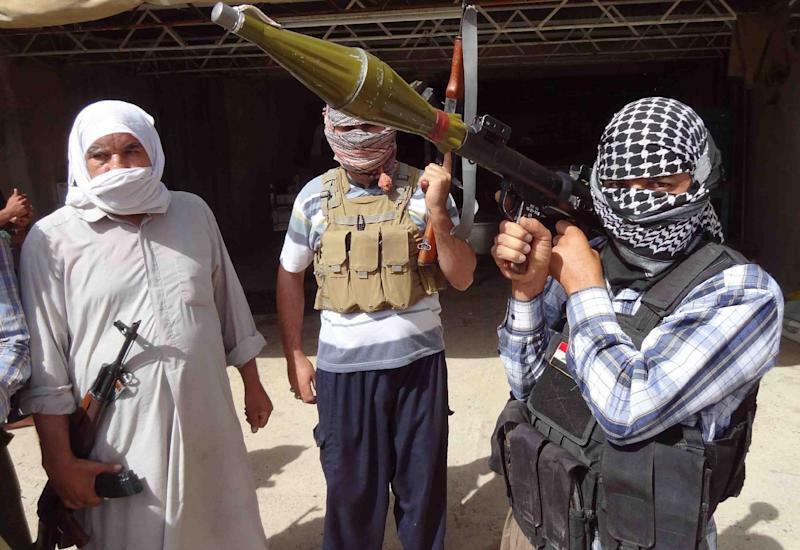 Then, this month, insurgents led by the jihadist Islamic State of Iraq and the Levant (ISIL) group overran swathes of five provinces north and west of Baghdad. They attacked the area around Taza Khurmatu, seizing the neighbouring Shiite Turkmen town of Basheer, and the Sahwa force swelled with new volunteers. "We took the decision to form this force to protect ourselves because of the growing terrorism," says 45-year-old Amer Abu Qarar. "We're fighting for the sake of the country and the honour of our religion," he adds, at a defensive line less than a kilometre (half a mile) from where the Sunni militants patrol. There are no firm figures for Iraq's Turkmen population, which is largely concentrated north of Baghdad and includes Sunni and Shiite Muslims. In Taza Khurmatu, Shiite professions of faith and icons of the sect's most revered figures feature as prominently as the Iraqi Turkmen flag, a light blue banner with a white crescent and star. Many of the men in the town cite religion as a reason for joining up, and particularly a call from top Iraqi Shiite cleric Grand Ayatollah Ali al-Sistani. Sistani urged Iraqis to "bear arms and fight terrorists," a demand many of the town's residents say they are religiously obligated to fulfil. "He who fights to protect his money, to protect his honour and to protect his religion is a martyr," says another fighter, who gives his name only as Ahmed. "I decided to join the Sahwa for the sake of the nation, my principles and my faith -- the religious call from Imam Sistani." On the front line between Taza Khurmatu and Basheer, the Turkmen patrol with Kurdish peshmerga forces. Publicly, both sides proclaim "100 percent cooperation" but the alliance is an uneasy one thanks to longstanding tensions between Iraqi Kurds and Turkmen in the region. The Turkmen consider much of the territory now incorporated into the autonomous three-province Kurdish region of north Iraq to be their land, and reject Kurdish attempts to extend control over ethnically-mixed Kirkuk. Out of earshot of the peshmerga, one Turkmen fighter who declines to give his name accuses the Kurds of taking advantage of the Sunni advance. "The peshmerga come and say they are protecting us, but we know they want to hold this area and make it theirs," he says. And the contempt is mutual, with a Kurdish fighter taking a reporter aside at the frontline to complain about the Turkmen forces. "These fighters don't do anything. They lie 100 percent of the time," he says, glancing sideways to ensure the Turkmen forces cannot hear. "When there is shelling or fighting, they run away. They have to say they are fighting because they don't want Kurds to be the ones in control." For all their suspicion, the Turkmen are committed to the alliance for now, aware of the consequences if Sunni militants who consider Shiites heretics enter Taza Khurmatu. Near the frontline lies a bloodsoaked door that was used to transfer the bodies of 15 Basheer residents killed when the Sunni militants moved in. Peshmerga and Turkmen forces say they included a child and three women who were shot in the head. Abbas has even committed his eldest son, 16-year-old Mohammed, to the fight. "He has been on the frontline and he was face-to-face with the terrorists in Basheer," Abbas says proudly. "It's his first war, but I'm not sure it will be his last."